Configure Price Quote software (CPQ) is a trusted sales solution for businesses across industries. With its ability to allow customers to design custom products and your sales team to automate quoting, CPQ has a significant impact on sales cycles and the customer experience. However, not all CPQs are created equal. To truly leave an impact on your bottom line and improve the quoting and ordering experience, there are certain CPQ features and benefits that you should look for in a CPQ solution vendor. Our CPQ guide and software comparison is great resource to help you narrow down your vendor options. It’s also helpful to know what each feature does and how it benefits your business. Fortunately, we’re here to walk you through it. People want to see what they’re buying—it’s that simple. Without the ability to visualize what the final product is, you run the risk of missing the mark and failing to meet customer expectations. To account for this, several CPQ solutions offer some type of visual product configuration. Most CPQ solutions in the market offer 2D product configuration, which uses still images to show customers what their orders will look like. These two-dimensional images and drawings provide customers with more context and information than a sales rep or product description could explain. In addition, 2D product configuration can show buyers real-time updates to see how their configurations affect the appearance of the product. While an image or drawing provides important, visual information, some CPQ solutions (including our own) take it a step further. Axonom offers interactive 3D product configurations with floor space planning to build products and design spaces. Visual configurators enable users to click, drag, and rotate the product to add components and explore all angles. This technology provides customers with an enhanced, more realistic representation of their order, enabling them to better visualize the final product. If a picture is worth a thousand words, imagine the information and context value that virtual reality provides customers. Visual product configurations with an extension to virtual reality transports customers into a near realistic environment to see, interact, and explore the product and/or room configuration. For products like operating room equipment, data centers, and fitness facilities, VR gives customers an immersive, first-person viewpoint of the design before finalizing the order. The Powertrak CPQ suite offers all three types of visual configuration options listed above to minimize order errors, build complex products efficiently, and exceed customer expectations. As a manufacturer or distributor of complex, custom products, you’ve experienced your fair share of product combination errors. These errors are costly for business, forcing refunds and decreasing customer satisfaction. Instead of relying on sales or even billing to catch those errors, a CPQ with an advanced rules engine does the trick automatically. A robust rules engine, like the one behind Axonom’s Powertrak CPQ suite, prevents pricing, bundling, and calculation errors from ever making it into a quote, let alone an order. Our engine is customizable based on your business model, ensuring that your customers and/or partners will configure your products accurately. Today’s sales teams operate on the go and their sales technology should as well. For easy access to customer orders, quotes, pricing, and proposals, you need to look for a cloud-based, mobile friendly CPQ solution. By deploying CPQ software in the cloud on NetPRM, your team can access the system on location during a client meeting and make important updates on the fly. A mobile-friendly interface also enables your sales reps to access important customer information while traveling on sales calls. Cloud storage and mobile interfaces not only increase the accessibility of the tool for your sales team, but they also save you the infrastructure and IT costs associated with installing and storing the software on-site. And with minimal overhead, your CPQ investment will have a greater ROI. AtlasIED offers its customers an interactive 2D configurator called Rapid System. Available on its website, users can configure racks, see BOMs and pricing, share and export designs, and complete the order. 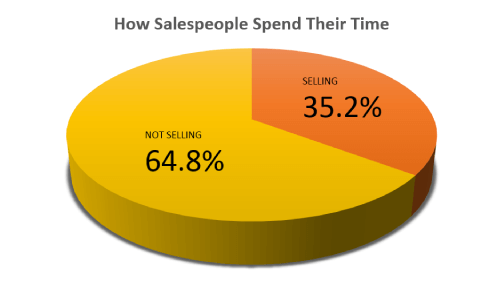 Salespeople only spend 35.2% of their time on selling. The other 64.8% is spent on administrative tasks, entering data into their CRM, attending internal meetings, and other non-sales-related activities. Fortunately, automation has the ability to eliminate a large portion of those mundane, manual tasks. For example, the CPQ feature of quoting management ensures that quotes are updated automatically as customers configure their orders. This reduces quoting errors while freeing up your sales reps to focus on closing the sale. Pricing management also provides automatic pricing updates that get applied system-wide to ensure accuracy and efficiency. Another way to increase sales efficiency is through guided selling. Guided selling enables customers to find and build their ideal product(s) without taking a sales rep away from other tasks. Through the use of custom questionnaires and forms to kick-off the ordering process, guided selling uses those answers to show customers products that match their exact needs. Your sales reps are also given the answers so they’re able to suggest relevant products or accessories, increasing the potential revenue from the sale. To really get a feel for how automatic quote and pricing management work, take a look at Powertrak CPQ in action at Middle Atlantic Products. The average salesperson has to access six different systems throughout the sales process. If you can find a CPQ solution that integrates with the majority of those systems (like your CRM or ERP), you will centralize all of that important information into one system for your sales team. And with important order and customer information at their fingertips, your sales team can respond faster to customer requests and questions, as well as propose more relevant cross-selling and upselling opportunities. Reporting is an important CPQ feature as it allows you to see where in the ordering process your customers are dropping off, which customizations are most popular, how successful your discounts are, and other important insights. Armed with this information, you can make significant improvements to your ordering experience, resulting in more orders going through and greater customer satisfaction. Quotes are automatically updated as a customer builds out their order. CPQ solutions speed up the sales cycle. No need to manually look up product compatibility and pricing lists. Faster sales cycles lead to greater sales capacity. In fact, companies with CPQ solutions have a 105% larger than average deal size, according to SuperOffice. Reporting gives you more visibility into how your customers order products and where opportunities lie for improvement. Automation and key system integrations save hours of work for your sales team. A robust rules engine takes human error out of the equation. Through an integrated CPQ solution, pricing updates take seconds, not hours, as your team doesn’t have to update the SQL database or prices in multiple places. Select the Right CPQ Features. Maximize Your ROI. For a CPQ to be truly successful and maximize your ROI, you need the above must-have CPQ features, including visual configuration, automation, reporting, and more. Axonom’s CPQ suite is loaded with all of those features and more. See what our CPQ solution can do for your business by requesting a demo.